Soaring membership costs at council-run gyms could put people off keeping fit, Labour has claimed. 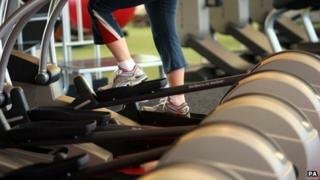 Annual prices have gone up by £100 at two-thirds of public gyms since 2010, a survey of 95 English councils found. Prices of evening fitness classes have also risen at almost every local authority centre and now average £5.95 per visit. Shadow public health minister Luciana Berger said it was a "real risk" to tackling obesity. The Labour research found a yearly gym pass now costs £368 on average, an increase of £15 since 2010. It also found that 48 councils had introduced above-average hikes, including a £91.50 increase by Wealden District Council and a £80.50 rise by Hastings Borough Council. Ms Berger said it could impact on millions of people across the country who wanted to kick-start 2014 by getting fitter and more active. "There is a real risk, however, that many people will be put off from keeping to their new year's resolutions by soaring gym charges and David Cameron's failure to tackle the cost-of-living crisis," she said. "With worrying obesity levels and stagnating physical activity levels, we desperately need ministers to make gym and leisure facilities accessible and affordable for all." Shadow sports minister Clive Efford said individual council bosses were not to blame. "Sadly, councils are either forced to increase charges or cut services all together," the Labour MP told the Daily Mirror. "This will make it harder for people on low incomes to access leisure facilities and these people already use these services in the lowest numbers." A Department of Health spokesperson said the government was "committed" to helping people lead "longer, healthier lives". "For the first time ever, we've given local authorities ring-fenced budgets to tackle public health issues in their local area," they said. "Councils can then decide how to spend this funding to help local people lead fit and active lives." A spokeswoman for Freedom Leisure, which operates 35 leisure centres in partnership with 11 local authorities, including Wealden District Council, said that while they have had to increase prices due to the "massive costs" involved in running leisure centres, they were "sensitive" to the situations of individual members and offered discounts for 14 to 18-year-olds, OAPs and people on benefits. "We review our prices annually taking a range of factors into consideration," she said. "Increasingly high running costs have to be taken into account but as a not-for-profit trust our goal is to be able to invest in community leisure provision year on year and we set financial targets accordingly. "We also take a close look at the economy, both nationally and local to each centre, to ensure we are able to offer affordable leisure facilities for all our communities. We review each membership category separately rather that issuing increases 'across the board'." The Local Government Association (LGA) said that individual councils were responsible for setting their own budgets for local gyms.